The medieval church of St Nicholas has its origins in an older religious site. After the Norman Conquest, the manor of Piddington was given to Judith, the niece of William the Conqueror, and in the mid-12th century the Muswell estate was part of the fee of Piddington. In the reign of William II, Guido de Ryhale and his wife, Joan de Piddington (tenant of the manor of Piddington), gave Muswell to Ralph, a hermit, who, sometime before about 1152, built a hermitage and a chapel dedicated to the Holy Cross at the top of Muswell Hill. Ralph endowed the ‘whole place’ of Muswell, including the chapel, to Missenden Abbey. The abbey retained possession until the mid-12th century, when it divided the estates between the convent of St Frideswide at Oxford and John de Plescy. Up to this point, the chapel was probably served from Missenden, but it was certainly served by the vicar of Ambrosden in 1396, when he was prosecuted for trespassing in the fields of Muswell manor in walking from Ambrosden to the chapel. The chapel was thus at this time considered an appendage of the manor. Although services continued there until the Dissolution of the Monasteries, they were intended for the lord of the manor and his immediate staff only, with the villagers participating only on certain holy days, when the inhabitants of Piddington would process to the chapel across the fields. The last ruins of Ralph the hermit’s chapel disappeared in 1800. In 1309 the lord of Piddington manor referred to ‘ornaments’ in his chapel at Piddington. This building was probably the same as the present church (formerly chapel) of St Nicholas, which contains late 13th-century work. The chapel lay in the parish of Ambrosden. 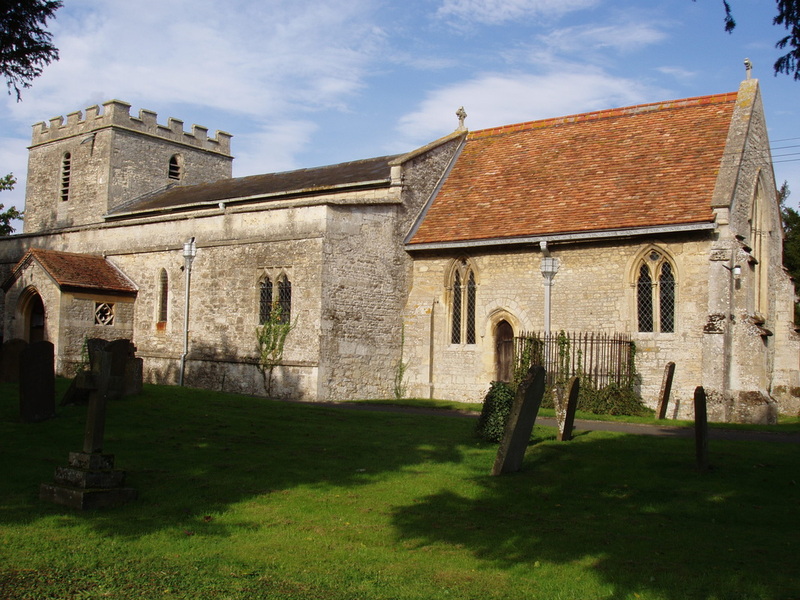 In 1428, after a series of disputes between the vicar of Ambrosden and the villagers of Piddington, it became a parish church with its own graveyard and full parochial rights. 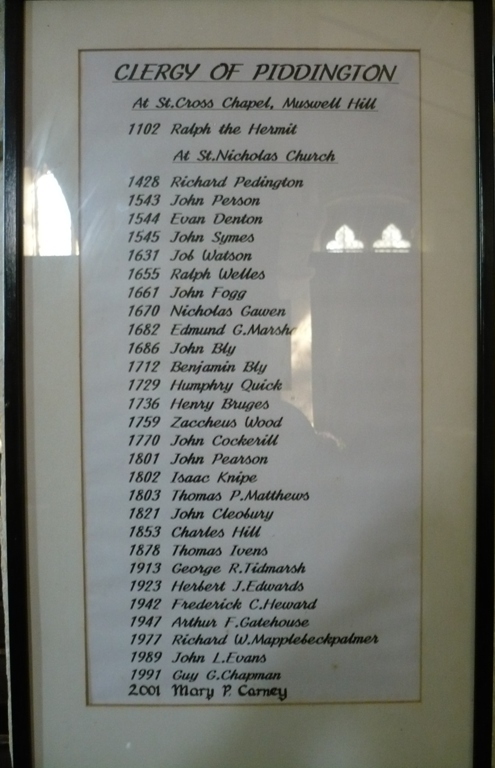 Among other things, this meant that the inhabitants of Piddington secured the right to elect their own minister, who had the authority to perform all the parochial duties and to whom the parish tithes were payable. In 1923 the right of election by poll of villagers passed to the Parochial Church Council. Extensive repairs to the church were undertaken in 1826, and in 1855 the interior was completely restored. There had been a musicians’ gallery on the north side and a southern gallery, set up in 1813, which, when removed, revealed the western arch. The belfry was then used for extra seats. 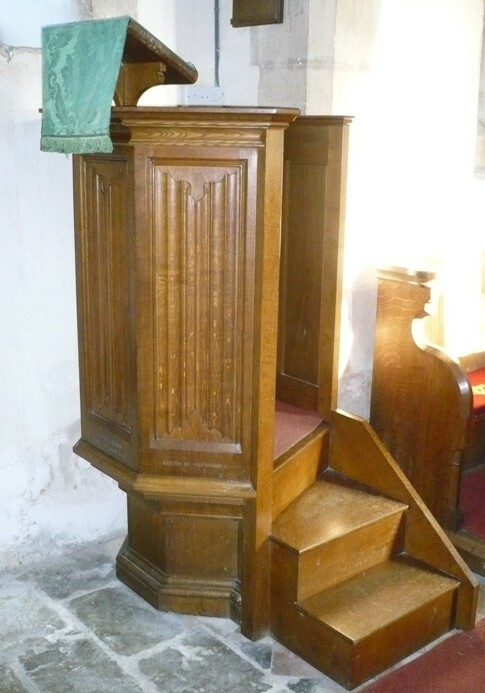 The pews were replaced by seats of a simpler design, and the pulpit, made by the carpenter William Parrott and installed in 1828, was also moved at this time. Restoration under the architect John Oldrid Scott was completed in 1898, resulting in the building of a new chancel arch and the reconstruction of the chancel ceiling in panelled oak. In addition, the nave was restored externally, the foundations underpinned and a new ceiling inserted. A new roof was built over the south aisle and the exterior was repaired. Various other repairs and alterations were carried out at this time, including the installation of heating. Lobel, M.D., ed. (1957) A History of the County of Oxford, Vol. 5: Bullingdon Hundred, Victoria County History, pp. 249–258. British History Website, accessed 20 July 2012. Photographs copyright © Stan Hearn.